With a degree from Kansas City Art Institute, Fort Worth native Guy Sanders started producing animated TV commercials in St. Louis in the early 1990s. His superiors didn’t see much promise. “I saw the writing on the wall and did what any starving artist would do... I joined the Army,” Sanders explained. After eight years as a military police officer and international tours in Haiti, Korea and Egypt, Sanders decided to get inside the box. He joined his family’s cardboard box business. Sanders’ grandfather started Bates Container in Fort Worth in 1963. By the time Sanders left the Army, it was one of the largest independent corrugated box manufacturers in the United States. When Guy Sanders asked his dad for a job, the elder Sanders shipped his son to the bottom, to San Antonio where a Bates facility had recently opened. Sanders proceeded to spend twenty years turning that plant into a model of innovation. Bates eventually sold to Irish conglomerate Smurfit Kappa in 2015. Sanders used the transaction to get out of the box. Sanders is thrilled to bring his range of knowledge to a local real estate project. “Having the opportunity to combine my interests into one entity in downtown Boerne, now that’s living the dream,” he said. Together with his wife, Joi, Sanders purchased the former Antique Mall at 153 Main Street in mid-2016. The 10,000 square foot building sits on a quarter acre lot in the middle of the Hill Country Mile business district. Early Boerneite Arno Richter built a small mechanic’s shop on the site in 1905. By 1950, a rising automobile industry prompted Richter to tear down his original structure and build a bigger one. The building’s past helped shape Sanders’ plans for its future. He wanted it to be a place of art and history. A 1922 Model T roadster will soon sit in the exact spot Richter once worked on cars. Sanders, still an aspiring artist, will hang his own Picasso-style paintings on the walls. Sanders plans on a mix of retail and dining in the revitalized space. Boerne Cork and Keg will move to 153 Main from its current location on West Hosack. Plaza Taxco is a Mexican jewelry shop with an existing location in La Villita, an arts community near the San Antonio Riverwalk. And Up Town Chic is a women’s clothing store with a thriving location in New Braunfels. Sanders will join with chef Chris Pheiffer to create Richter Tavern on the building’s second level. 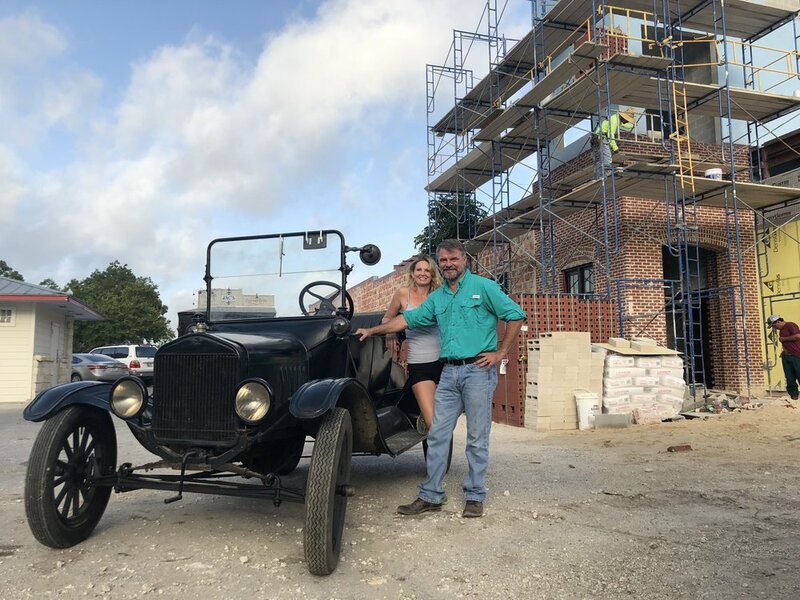 The restaurant will feature a nineteenth century solid cherry bar that started in Max Beseler’s Metropolitan Saloon in what is now Boerne Grill. The bar was used in ice cream parlors during prohibition. It eventually ended up in Antlers Restaurant in the Dienger Building before being moved into Frost Bank’s board room in 1981. Sanders acquired the bar from Frost which was happy to keep the bar in the Boerne community. Silent movies from the 1920s and 30s will project on the restaurant walls. Restaurant employees will steep in the building’s history and wax philosophical at a moment’s notice. “By the time it’s over, the bartender will be making up a bunch of crap that never happened,” Sanders joked. According to Sanders, the outpouring of community support has been staggering. “Of the 800 comments I’ve received online, all have been positive except for three - and one of those I converted,” Sanders said. Sanders said The Shops at 153 Main will open in stages between fall 2018 and spring 2019.